SeeOnce is a little app that encrypts text and files for emailing so only the intended recipient can decrypt them once, and after that nobody can decrypt them again, including the recipient. This is as close to "self-destruct" as email can get. No servers are involved and so nobody else has your private data or the key that decrypts it. SeeOnce is open-source and free, because we believe privacy is a basic human right. 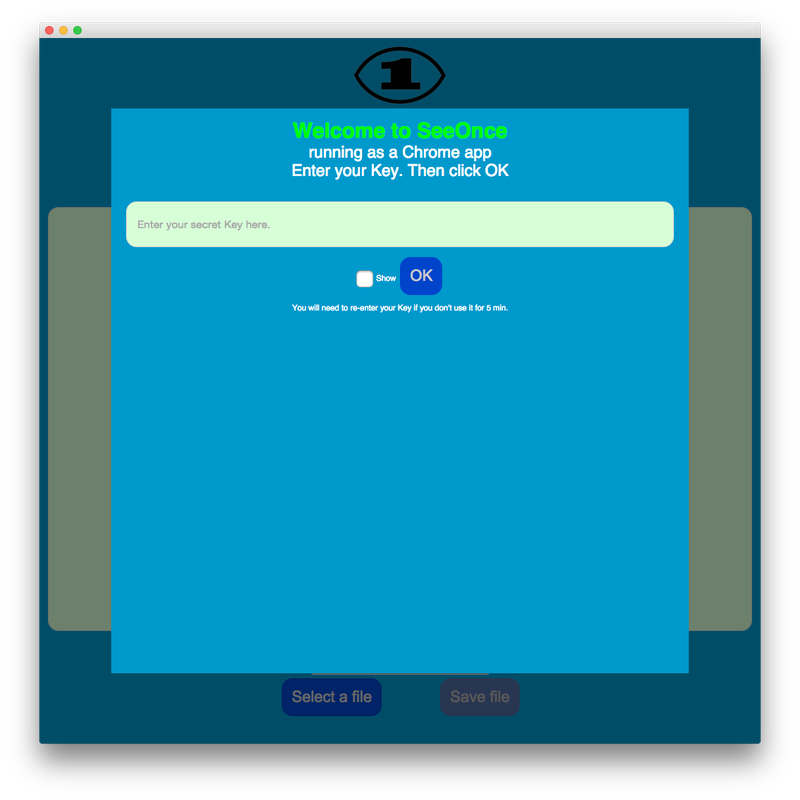 With SeeOnce, you don't need to deal with public keys, certificates, or anything of that sort. You don't need to make any accounts, anywhere. You just lock messages, email them, and get the replies automatically unlocked. You can run SeeOnce on a public computer or a borrowed smartphone as securely as behind a corporate firewall. When you are done with the machine, you can leave no traces behind. The Chrome app version will sync all your data through the Cloud. SeeOnce uses 255-bit elliptic curves (Curve25519) and a powerful, fast stream cipher (XSalsa20), together with variable key-stretching based on a dictionary-based entropy meter (WiseHash). Random ephemeral keys are used once and discarded. SeeOnce can open real-time chat sessions that include text, files, or even video. Connection is direct between computers or smartphones. For the paranoid among us, SeeOnce can disguise its encrypted output so it looks like regular text. Priority number one for just about every other email encryption app out there is to make money for its creators. This is why they need to store your private data (whether encrypted or not) and/or the keys that decrypt it, so they can charge you later on. On the contrary, SeeOnce has nothing yours, which frees it to give you real privacy.